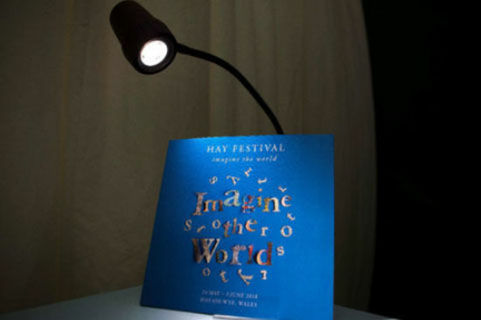 The Hay Festival, the UK’s largest literary festival, takes place for the 32nd time this year between 23rd May and 2nd June. As a sponsor of the world-famous event for the past two years, we are pleased to announce that we are partnering with Hay to launch a brand-new reading space for 2019, the Serious Reading Room. As well as seeing the range of Serious Lights at our usual stand, festivalgoers will be able to pop into the free-to-access venue at any point over the 11-day event. A calm, quiet room will play host to an eclectic mix of comfy furniture where avid readers can pore over the latest addition to their libraries under the life-changing light output of a Serious Light. The Serious Reading Room will also feature daily surprise readings from Hay Festival speakers. An eyestrain free venue – each impromptu event will take place under the illumination of multiple Serious Lights, so you can relax and enjoy each session as we bring daylight indoors in our bespoke reading space. Hi Jenny. Many thanks for your comment. We are all very excited about this development. After two years of sponsoring Hay, we are delighted to be able to provide an extra degree of reading comfort to festival-goers.